I realize that Buenos Aires is considered a mecca for meat, but I have been on the hunt for great seafood and fish in this carne-crazed town. It's a tough ask. Each bite brought me a bit closer to the sea. Yet, I get the feeling that these meals were aberrations in BA's bife-obsessed food scene. Most restaurants offer very little by way of seafood and fish. 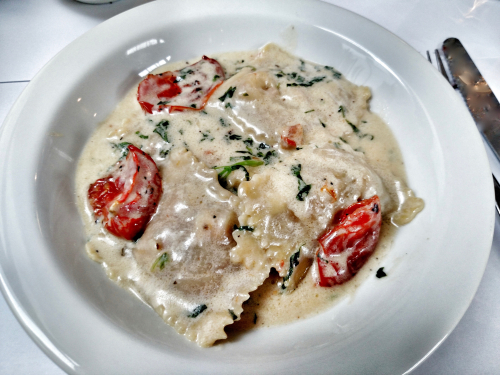 And, while these two dishes were fantastic, they are the exception to the rule. 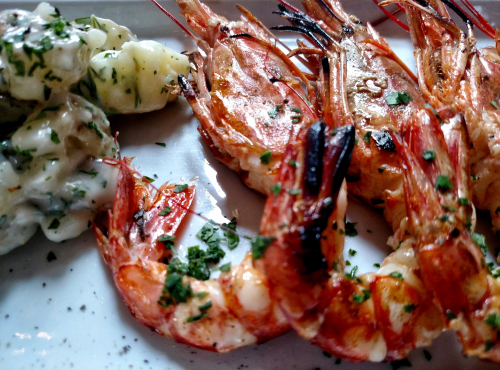 Case in point: La Mar, the city's Peruvian import, a high-end cebicheria that is on every critics' "must visit" list. It was a total disappointment. The menu had a focus on fish, yes, but they drowned most of it in sickly sweet sauces. Even the classic ceviche was lackluster in many respects. Some of the flavors were spot-on, but ultimately the kitchen didn't trust the fish to grab the spotlight as the star of the show. And, although BA has many sushi spots, maki with gobs of cream cheese is the norm. Authenticity and quality fish really aren't the sushi strong suits here. Think middling salmon and tempura rolls. Meh to say the the least. Well, what about making fish or seafood at home? Aren't there some solid fishmongers in town? Um, no. Several locals urged me to visit Barrio Chino, which supposedly has the best that BA has to offer. Let's just say that if that's the best the city has to provide, I understand why folks stick to meat here. So, am I "Debbie downer" when it comes to things aquatic in Buenos Aires? Not entirely, but I will say that I can't wait to sink my teeth into some really good sushi when I get back to New York. Until then, though, I will revel in BA's beefier delights. 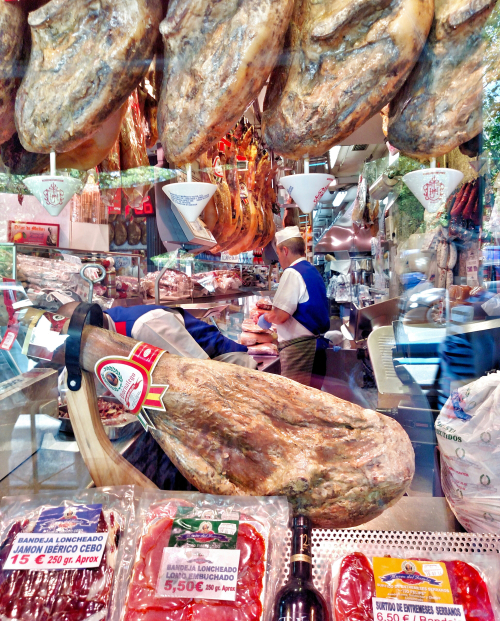 Nothing in Spain seemed quite as vital to the national culture as its glorious, dry-cured ham. Gin and tonics came in at a close second, but Jamon definitely ruled the day - and, the night too for that matter, when restaurants save space for a decked out leg of Jamon iberico with a knife-wielding ham-slicing expert at-the-ready. More often than not, two or three bone-in beauties are polished off in night. 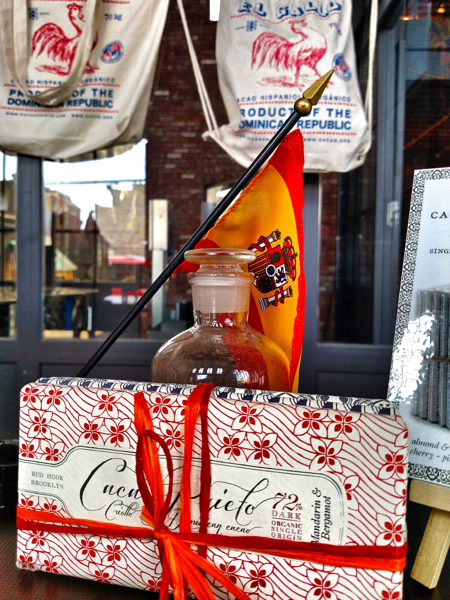 ...a small Madrid chain of grocery stores dedicated to the history and majesty of Jamon. Thinking this would be an excellent franchise opportunity for someone in the States. Happy to make an investment. 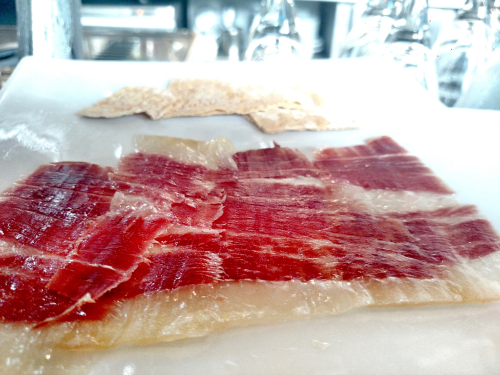 After relishing this gorgeous delicacy on its home turf, thinking Jamon is probably a safer bet than gold right now. And, goodness knows, it's a lot more tasty. Any excuse to go Astoria's Muncan Food - Serbian butcher shop extraordinaire - is alright by me. My latest excuse? A friend's birthday. 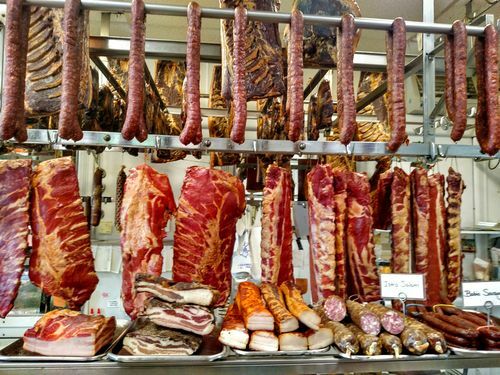 What better gift to offer up than a selection of delicious Serbian meat products? And, once I led my pal Allison into the meat-riffic shop, strewn with gorgeous smoked slabs of pork ribs, thick garlands of sausage and an abundance of house-cured salamis, she most certainly felt like the birthday princess she has always dreamed she could be on the glorious anniversary of her birth. No need for a birthday hat or a cake when you can celebrate with warm, chewy nubs of pork cracklings. 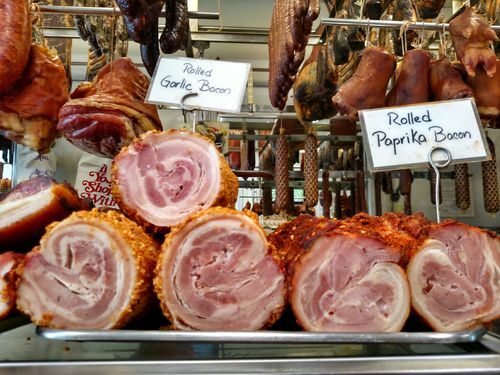 Then again, what party is complete without an array of bacon, from rolled paprika-style to pepper panceta? Guiding us through the meat maze (straight to the lamb salami) was Muncan's ever-knowing Zoran - or as I like to call him, "The Willy Wonka of Meat." He is more than a butcher: He is a Serbian meat master. So, if your birthday is around the corner and you want to commemorate the occasion with some meaty magnificence, drop me a line. I'll be quick to catch the R to Steinway and meet up for a meat up. Heck, I'll even bring along a candle to stick in the Balkan cold-smoked pork loin. 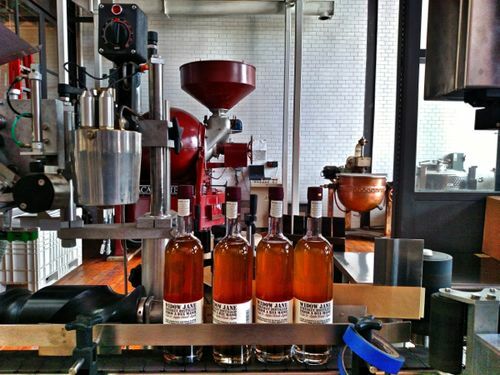 Organic bean-to-bar chocolate factory meets premium Bourbon distillery. 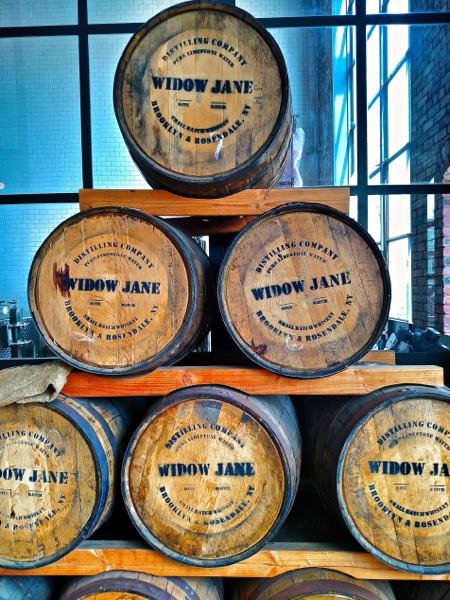 ...and equally brilliant barrels and bottles filled with Widow Jane Bourbon and Rye. Not gonna tell you much more, because I think you should go yourself and take the full-on tour with tastings. 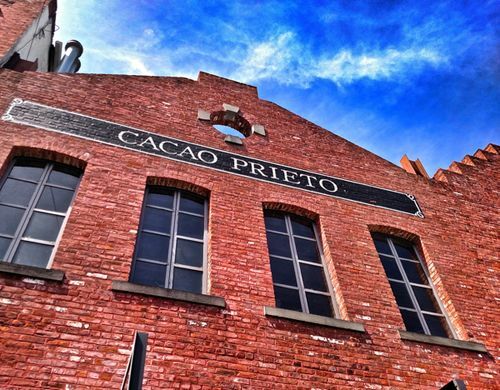 All I can say is that I'm craving another one of those Pistachio and Apricot 72% Dark Chocolate Bark bars, and I have a bottle of Widow Jane Malted Chocolate Bourbon Whiskey sitting on my bar, waiting for a friend and a couple of rocks glasses. No one prepared me for a typical late October morning in Budapest -- bright skies, but blustery and cold. That, my friends, is a glass of Unicum, Hungary's traditional herbal amaro liquer. 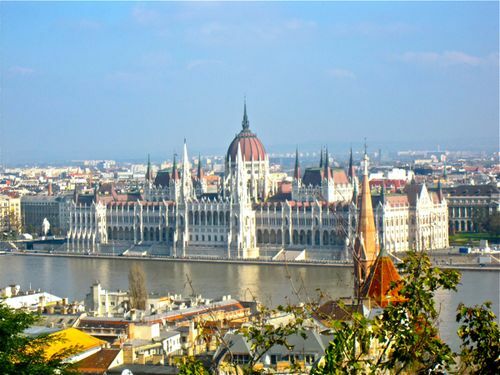 My first morning in Budapest was an especially frigid one and I was quickly informed by natives that I would be remiss if I didn't partake in a shot before I started my day. Start my day it did, packing a wallop and warming the body, while it scorched my throat. 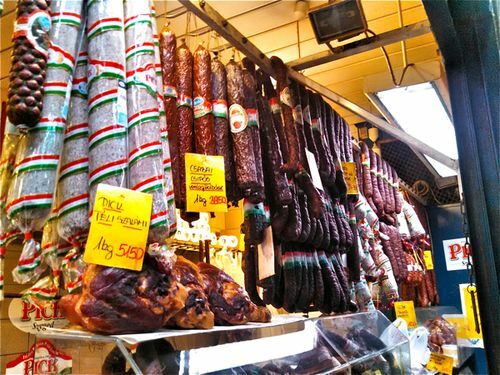 Other tastes of Hungary were more to my liking, including some sampling of the wares at the city's bustling Central Market. Smokey paprika-crusted pork sausage was a particular favorite, as was a dry, mild "Gypsy" salami. 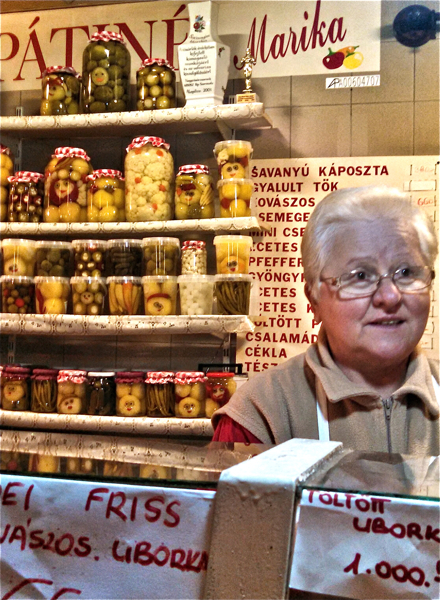 A visit to the "pickle lady" in the market's basement led me to sample vinegary, spicy pickled peppers, along with orange nubbins of pickled carrot and mouth-puckering pieces of pickled cauliflower. A short stroll over to the Jewish Quarter offered up a much sweeter treat, cake from Rachel Raj -- who is quite literally the Rachael Ray of Hungary. 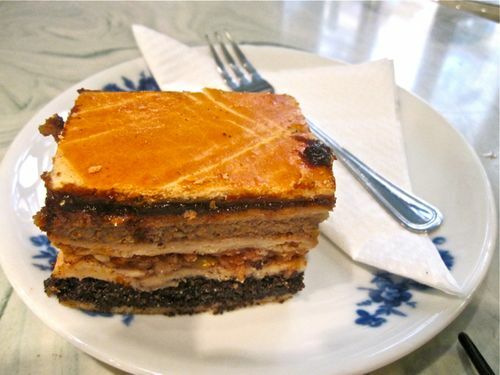 The cake in question was Flodni, a layered confection made with squares of pastry crust alternating between generous helpings of honeyed poppy seeds, walnut paste, plum jam and a filling of slivered apples. Not too sugary, it almost ventured into savory territory. Not too shabby, eh? 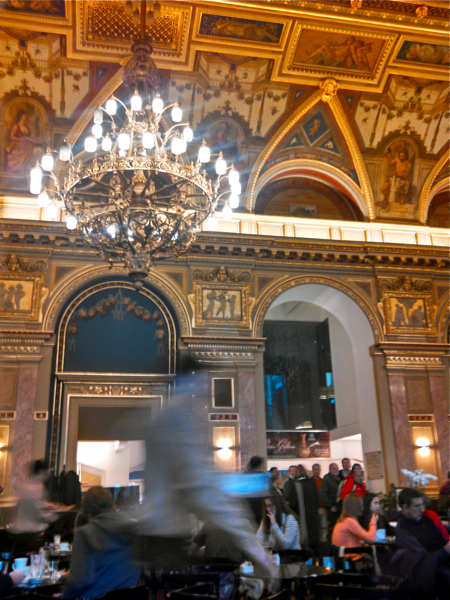 But do notice that I went for coffee, not Unicum -- not to say I didn't drink in Budapest. I'm so not kidding. See that photo up there? It's a photo of a New Catch Holland Herring from Shelsky's with all of the classic accoutrement, namely finely diced sweet onion and minced pickle. This stuff isn't just good: it is fish butter. And, if Shelsky's is out of the New Catch Holland Herring (it has a ridiculously small season), they have plenty of other herring to offer. 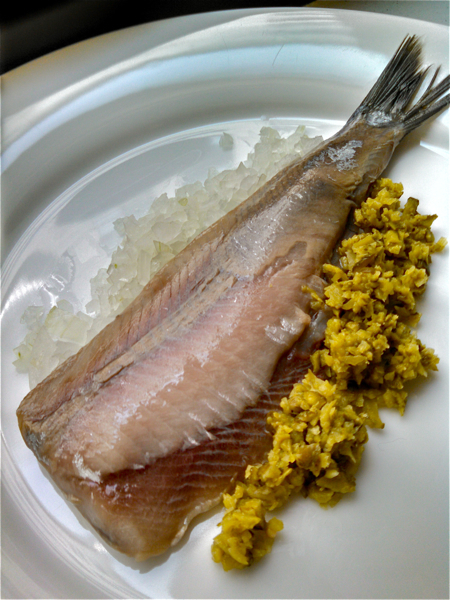 I'm a bit leery of the Fiery Jamaican Jerk Herring, but the French Oak-Smoked Herring has been known to illicit oohs and aahs from yours truly. 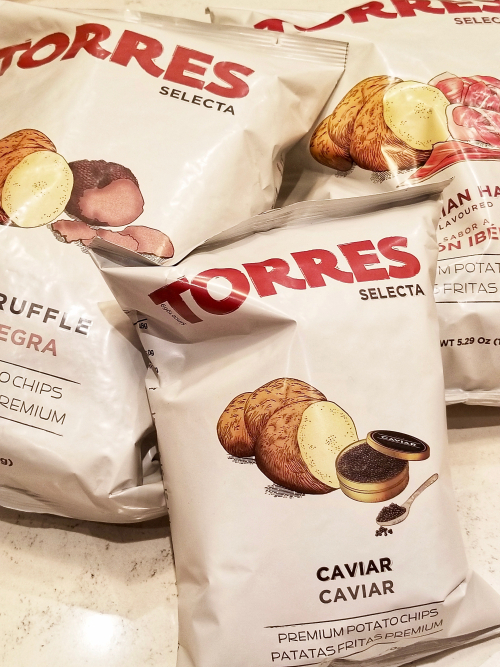 Then there is their righteous Smoked Whitefish Salad, smoked salmon options that run the gamut from Irish Double-Cured Organic Salmon to House-Cured Szechuan Kung Pao Salmon to classic Belly Lox, and let's not forget faves like Sable, Fancy Lake Sturgeon and Bering Cisco. And, if you're inept at piling all of these tasty trappings onto a bagel, they have experts there who can do it for you, with a hunger-inducing menu of sandwiches like the Fancy Pants, featuring the above-mentioned Fancy Lake Sturgeon, as well as House-Cured Gravlax, Ben’s Cream Cheese, Tomato and Red Onion served on a Bagel or Bialy. It's amazing how easily I forget what a real strawberry tastes like. As Brooklyn's streets are piled high with slush and snow, I am completely satisfied with my supermarket berries from Chile. Red, uniform and slightly sweet, they are what pass as delicious when the wind chill is below 25 degrees. Fast forward to spring and a visit to my neighborhood greenmarket, where local berries, bursting with juicy sweetness are lined up in basket after basket, waiting to be downed in various forms -- chopped and tossed into the buttery batter of a Honey Pound Cake, or cut into slivers for a sunny addition to a Baby Spinach Salad with Goat Cheese, or simply sliced and heaped in a bowl with a splash or two of good Balsamic vinegar. For now, I will dive in and enjoy berries as they were intended. 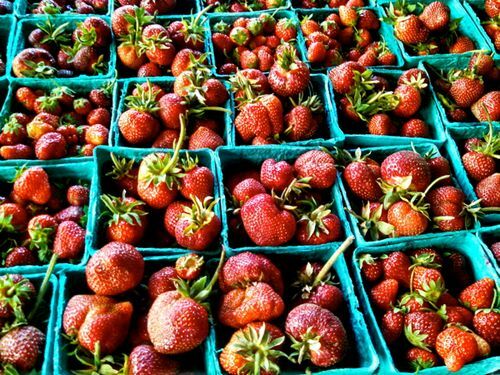 Yet, I know as the autumn returns, my tastebuds will forget -- a convenient amnesia of sorts -- until springtime rolls around again and the strawberries are ripe and ready. I've always considered myself an adventurous eater, but my dinner at The Explorers Club Annual Gala took my epicurean exploits to a whole other level. The evening opened up my palate to scorpions, goat brains, meal worms, maggots and other exotic nibbles. 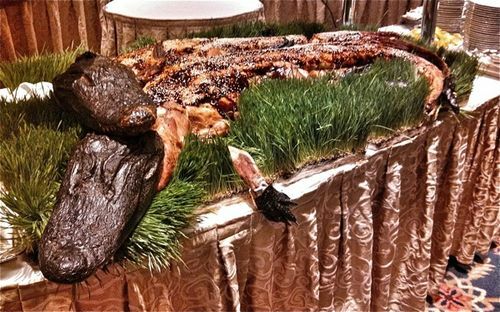 Truthfully though, it was the alligator that caught my eye and my taste buds. I was a doubter at first, but I have to say that the alligators, pictured above in their 7-foot long glory, were downright delicious. Sort of a cross between eel and - you guessed it - chicken. Keeping the gator momentum in play, a couple weeks back I was in Florida to visit Papa Vamp and spied some live alligators sunning themselves on nearby golf course. Before I'd eaten one of those suckers, the sight of them would have made me dream of shoes and handbags. Now, I was simply thinking of dinner. And, today I'm in New Orleans with Mama Vamp for a few days of food, drink and jazz -- and quite possibly, alligator. I have a reservation at Cochon for lunch later and I have to say that the kitchen's Fried Alligator with Chili Garlic Mayonnaise sounds awfully tempting. Then again, I bet they could Cajun-up some maggots and they'd sound awfully tempting as well. I'll stick with the alligator. It's time to stand up for the wee raisin. All too often, baked goods are passed over when someone learns that they are dotted with raisins instead of chocolate chips or nuts. It's a real shame. 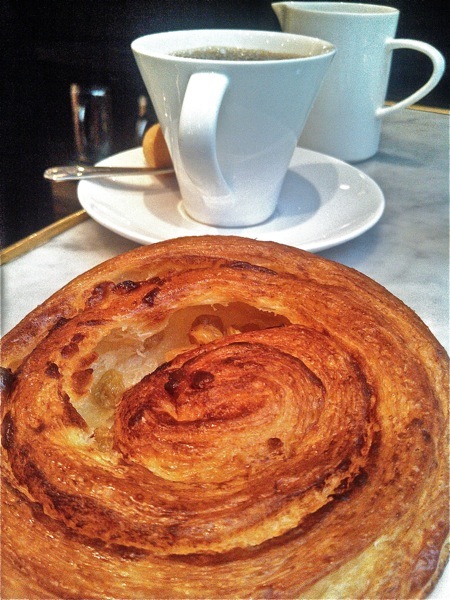 A prime example: The burnished and buttery Raisin Danish featured above was had at Maison Kayser in the Flatiron District. It was a beauty, studded with plump golden raisins. Wholly satisfying. I think the real trick with raisins is in the plumping. Don't simply toss them into a recipe without giving them the love they need in advance. Let them steep in hot water or, better yet, some heated rum, bourbon or vino. Once they are ever-so-slightly reconstituted, they offer a sweet luscious addition to cakes, pies, muffins and more. And, if you really can't bear to give raisins the old college try, maybe you should attempt to embrace their kissing cousin: the dried currant. These tiny morsels, also in need of a bit of rehydrating affection, aren't just ideal for scones, but play well in savory dishes too. In fact, I'm planning a Thanksgiving stuffing that includes these tart berries alongside sourdough bread, scallions, garlic and toasted pine nuts. I don't know how many readers I'll really convince with this missive. But, I can assure you that you are missing out if you choose to reject the glory of the raisin. Well, guess that leaves more Raisin Danish, Raisin Oatmeal Cookies, Currant Scones, and alike for me. And, I'll probably get to actually have some T-day stuffing leftovers for a change too!